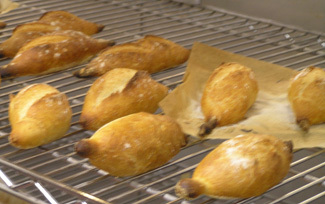 Who can resist hot bread fresh from the oven? I loved learning the art of bread making from Chef Boulanger Mark Fiorentino of Daniel as part of the New York Culinary Experience hosted by New York magazine and The International Culinary Center. Over the past few years, I have come to love making dough to create breads, pizzas, rolls, and more. So, when the opportunity to learn from a master who has been with restaurant DANIEL for more than 13 years, I could not wait to sign up for the class. 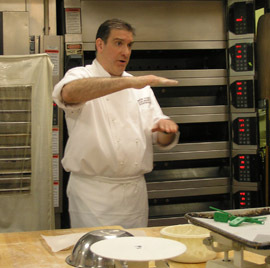 On April 28, 2012, I had opportunity to attend the more than 3-hour hands-on dough class taught by Chef Boulanger Mark Fiorentino as part of the New York Culinary Experience at The International Culinary Center. Prior to the class, I spoke with Chef Fiorentino and he was happy to hear that I like to work my dough by hand and that I do not rely on dough machines or food processors. As he stated, the more you work with the dough the more you get a feel for the depth and potential of your final product. 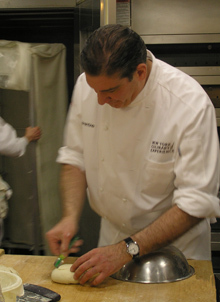 Chef Fiorentino is a graduate of the Scottsdale Culinary Institute and his love of dough brought him the distinction of being the Chef Boulanger for all of Chef Daniel Boulud's endeavors, which include DANIEL, Cafe Boulud, DB Bistro Moderne, Boulud Sud, and Épicerie Boulud. Chef Fiorentino was excited about his move to a new location next to Épicerie Boulud, where now he has over 1000sqft of workspace to create outstanding breads and rolls that have become an integral component of the Chef Daniel Boulud experience across all of his restaurants. Chef Fiorentino talked about the key ingredients to making bread, which are bread flour, water, yeast, sea salt, and the most important ingredient, as taught to him during his early years in culinary school, time. Being patient with your dough and working with it regardless of the external influences such as room temperature and humidity, which will affect your dough so that no two days of dough making will be the same, you will learn to get a feel for your dough, and that you need to always allow the secret ingredient of time to factor in to the final product. Method: In a large mixing bowl, combine the flour and 1-cup water by hand until all of the flour is hydrated. Cover with plastic wrap, and set aside for 20 minutes. Meanwhile, in a small bowl, combine the yeast with the ¼ cup of lukewarm water and stir until dissolved. Add the water and yeast mixture to the large bowl with the dough and sprinkle in the salt. Knead by hand until all of the water is absorbed and all of the salt is dissolved, about 6-8 minutes. Transfer dough in a lightly-oiled airtight container and store in refrigerator for 8-12 hours. Remove dough from refrigerator about 2 to 3 hours before you work with it. Arrange a rack on the lowest rung of the oven and place one rack above it - remove any other racks above the second. Place the sheet pan with the stones on the bottom rack of the oven and preheat the oven to 475° F (246° C). Divide the dough in three pieces and place on a lightly floured flat surface. Pat one portion of dough gently with the palm of your hand and fold it over onto itself, then roll into approximately 5-inches a log shape. Repeat with remaining dough. Let rest, covered with a damp towel, for 20 minutes. Gently pat one log of dough with the palm of your hand into a rectangle shape, leaving some large bubbles in the dough. Form the loaf by folding the furthest edge of dough over towards you to overlap the bottom by about 2/3, gently drawing the skin tight over the surface, and sealing the length of the loaf by pressing the seam against the work surface with the heel of your hand. Turn loaf 180° and make a final straight seam by folding the edge furthest from you over itself by ½ and pressing with the heel of your hand. Turn loaf 180° and repeat the same motion. You want to leave some air bubbles in the dough. Turn loaf 180° and make a final straight seam by folding the edge furthest from you over itself by ½ and pressing with the heel of your hand. Elongate each baguette by rolling it back and forth on the work surface. Begin with both hands over the center of the loaf and work them out to the ends until the loaf is approximately 16" long. 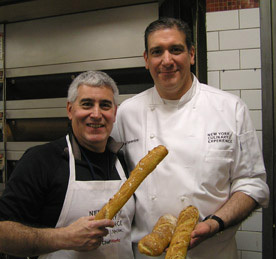 Transfer the baguettes (seam-side down) to the parchment and cornmeal-lined sheet pan, cover loosely with a damp towel. Let rise in a warm spot for 30 minutes. Use a single-edged razor blade or a sharp thin knife to slash the dough 4 times diagonally across the top. Each cut should be about 1 ½ inches long. Transfer the tray to the oven and toss the ice onto the sheet pan with the stones on it. Close the oven door immediately. The steam generated will help the breads to form a nice crust. Bake for approximately 20 minutes until the breads are crisp and browned on the outside and sound hollow when tapped. Remove from the oven and cool on a wire rack. Use caution when opening the oven door because the steam will be EXTREMELY HOT as it escapes. 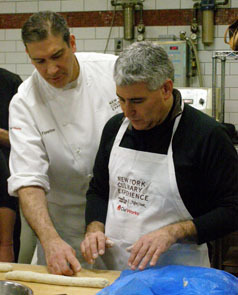 Read about Chef Mark Fiorentino's class in the Gastronomy section.